Wine tasting at the Vines of Mendoza tasting room. The province of Mendoza bewitches her visitors in a number of ways. Some find peace in her tranquil beauty. Others are lured by the rafting, biking, and outdoor life. And many more still fall in love with Mendoza’s sun-drenched wine country, and then start daydreaming how they could stay. That’s exactly what longtime friends Dave Garrett and Michael Evans did when they traveled to Mendoza together in 2005. The result, luckily for us, is the Vines of Mendoza. A wine-centric business, it gave them an excellent reason to stick around in a place that is becoming known in some circles as the “next Napa.” Not a bad gig. Both former tech entrepreneurs, Evans and Garrett teamed up with Pablo Gimenez, of a local wine making family, to create the city’s first, upscale, tasting room that culls the finest bottles from the province’s some 650 bodegas in a beautifully refurbished Mendoza home. But the tasting room and the Vine’s boutique Acequia Wine Club, are only the run up to the jewel of the project—a destination wine resort and private vineyard estates on 1200+ acres in Mendoza’s Valle de Uco, an arid valley that boasts the region’s highest-altitude vineyards and stark views of the Andes. “We wanted to build an asset that would be around forever,” Garrett said of the long range plans of the founders. This is something that “flies in the face of both of our experience” he said, explaining that as a tech entrepreneur he spent a lot of time on software only to see it become, eventually, obsolete. Yet if the trends are to be believed, the region and the Vines will only continue to prosper. More people around the world are discovering the incredible taste and value of Argentina’s wines every day. The wine business in Mendoza is booming. Recently, wine critic Robert Parker of The Wine Advocate gave three of the Bodega Achaval-Ferrer’s wines 96 points or higher in his first in-depth coverage of Argentine wine. With Mendoza’s excellent soil and room for growth, there is no where to go but up, Garrett said. It seems so at least for the Vines of Mendoza. The wine club is shipping wine to fans of Argentina’s finest wines in the U.S. and in Europe. 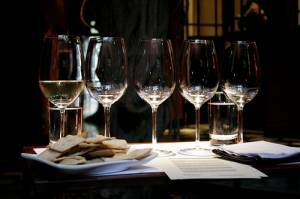 The Vines’ tasting room, located half a block from Mendoza’s Plaza Independencia, serves 150 visitors a day during high season and features over 90 wines from over 40 different wineries. To serve the many travelers looking to take a tour of the area’s many bodegas, the Vines also hosts an information center. Like the making of a great wine, the creation of the Vines of Mendoza has been a steady process for the founders. This article was published while I was in Mendoza, and inspired me to check out Vines. I happened to find this on a Wednesday, so I went over for their vintner talk, which was great. I stayed for a “flight” sampling in the tasting room, and had a great time (and returned the next night for more…). The facility is really classy and comfortable, and the staff and wines are great. Highly recommended, if you want to sample some great wines without schlepping around to a bunch of vineyards. “a destination wine resort and private vineyard estates ” Sounds nice. This page rendered in 0.621 seconds.